Our soils are mostly sandstone with some clay. We have built the soil with the use of a “weed badger” and mowing, as we started with forest soils. We do not irrigate, so the vines show some variable growth; but we believe that this stressing will be reflected in the flavour of our wine. During the winter the Farm’s sheep are pastured in the vineyard where they lamb in early spring. In 2016 we began another two fairly large projects: at the vineyard we are constructing an implement shed with second story storage. One end of the building is intended for on farm accommodation. 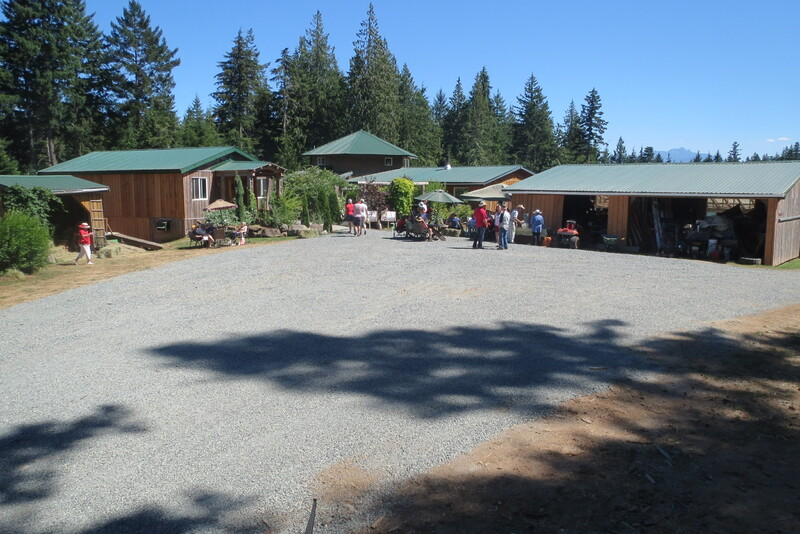 Most of the building is done with lumber milled on the property from trees cut down to make way for the vineyard. We expect to be pretty much done with this project by the end of 2017. We have also acquired another parcel very near the vineyard with the intent of creating more pasture for our sheep, as well as growing hay for the winter. This land is now cleared, levelled, seeded and growing the grass as we speak. Sequoia trees will line the edge of the driveway up this property, it will be fully fenced and we expect to create a lovely productive farm here. Ortega – A cross between Muller-Thurgen and Siegerrebe, this is our main white planting. They give us a consistently generous crop and make a crisp, aromatic wine, lovely for summer sipping. We call this wine Sandy Island White; Sandy Island being the marine park at the northern tip of Denman Island. Siegrebbe – A smaller, more recent planting showing much promise. We will again have a limited amount of this aromatic white for sale next summer. Marichal Foch – A French-American hybrid, this red grape ripens dependably in our climate. It produces an inky red wine. This vine needs very little intervention beyond pruning, so is very suited to our certified organic vineyard. We call this wine Chrome Island Red after the very picturesque lighthouse at the south end of our island home. A combination of our own thornless and Denman wild blackberries, this achieves a high alcohol content with no fortification. It takes a year to finish fermenting, so is released in limited quantities.